We are going to work outside to keep the dust down in the shop. There is varnishing in our future. 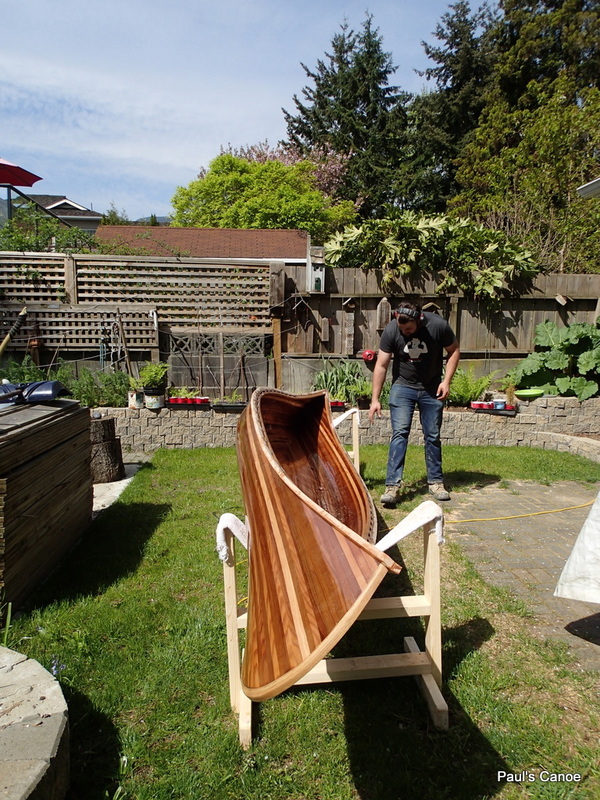 A perfect afternoon for working on the Canoe. Warm, sunny with a little breeze to take the dust away. We get ready to work on the gunnels. We are going to take around ⅛” off of the gunnels. This will give us a clean edge. If the gunnels still look a little too thick, we will plane off another 1/16″ or so. All eye-work. Paul files off some epoxy “flash”. 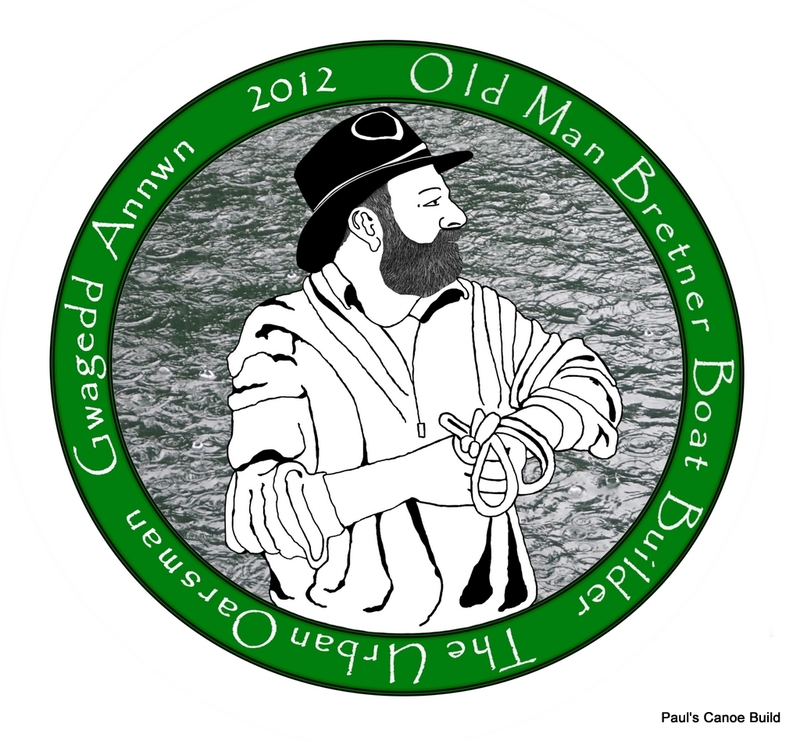 I hold the canoe steady while Paul cleans the gunnel so the power planer will not hang-up on anything. 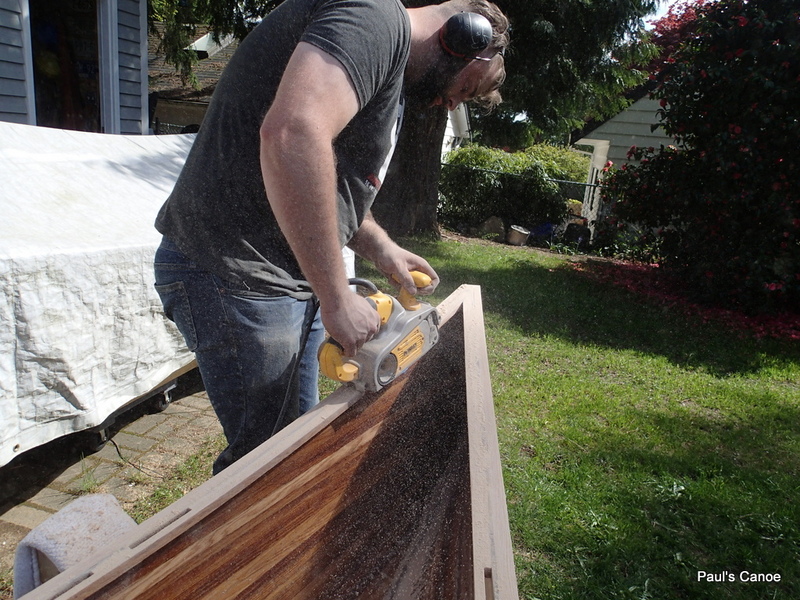 Paul decides on two passes of the planer…about ⅛” of an inch. Checking the outer gunnel thickness. Paul is happy. 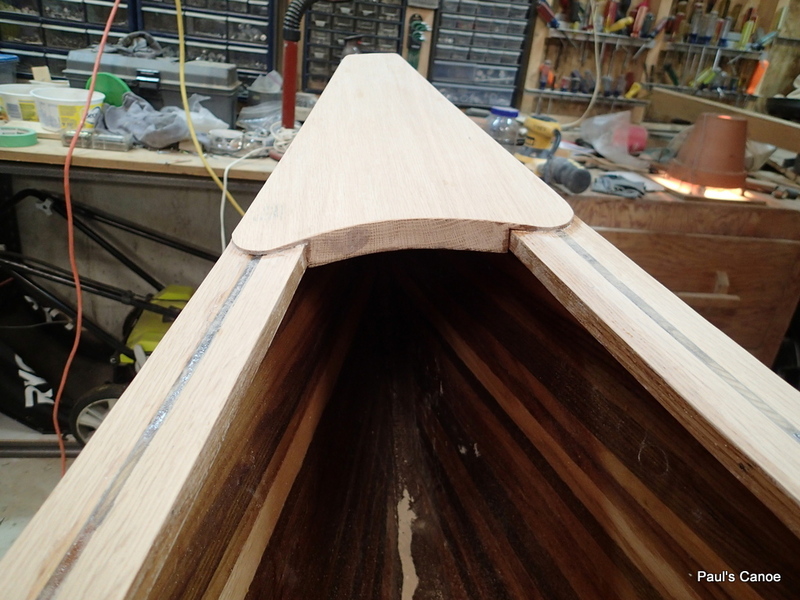 Paul now sands the shear-line, leveling the gunnels with the cedar hull strips. Start with 50 grit belt. We were pretty careful with aligning the gunnels and the shear-line. Not a lot of sanding to do. Dusty business. Finish with the 120 belt. After Paul finishes sanding a round-over onto the gunnels, I make a paper pattern for the decks. The two decks are not exactly the same. 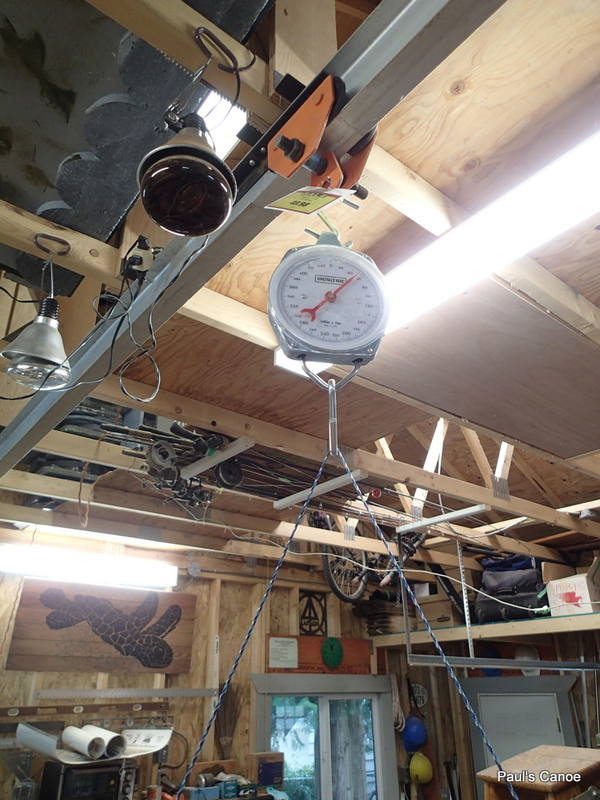 I transfer the pattern to the 1″ thick S2S oak stock and use my bandsaw to cut it out. 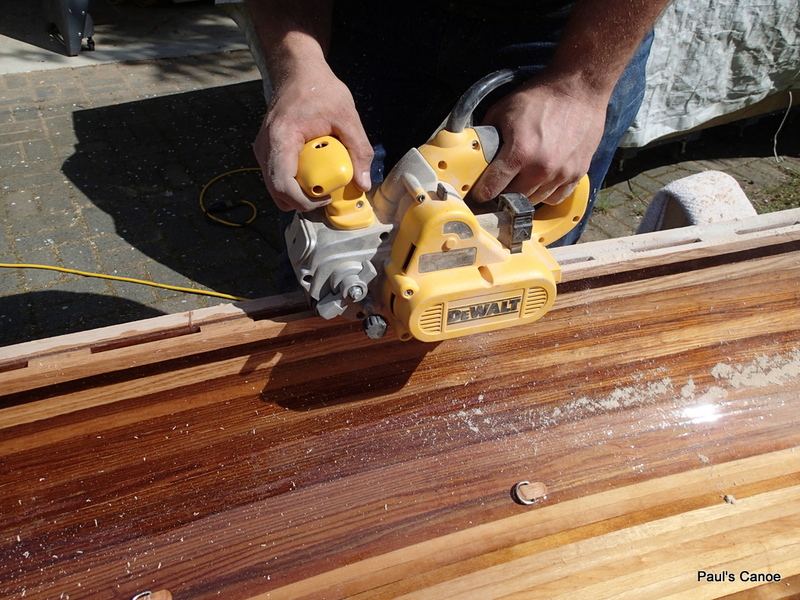 I am going to Dado the two sides to fit the inside gunnels. 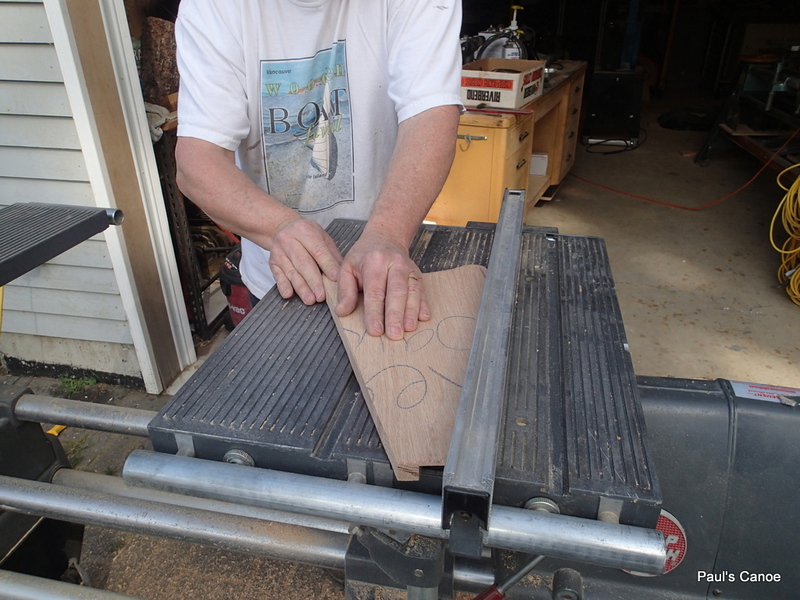 Cutting the Dados. Slow and careful. Paul has decided that he wants the decks to appear to be just over ⅛” thick. I adjust the Dado blades accordingly. 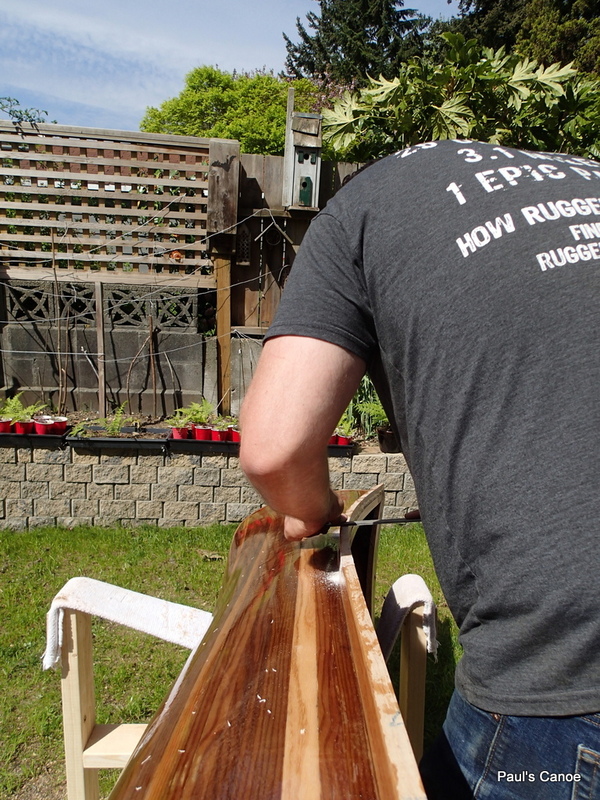 We line the dados with cloth and lots of epoxy. 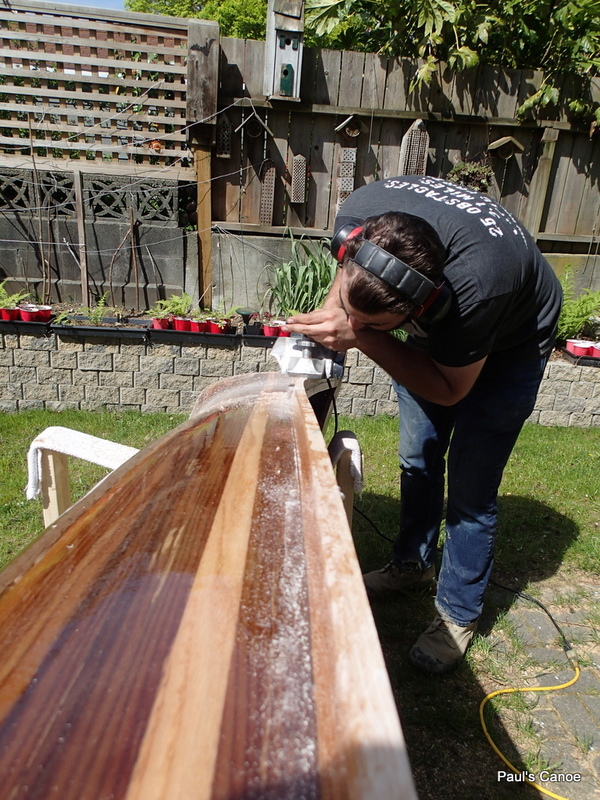 We put the decks on with the canoe right-side up and then flip it upside-down so the epoxy drips will not run down the sides of the canoe. 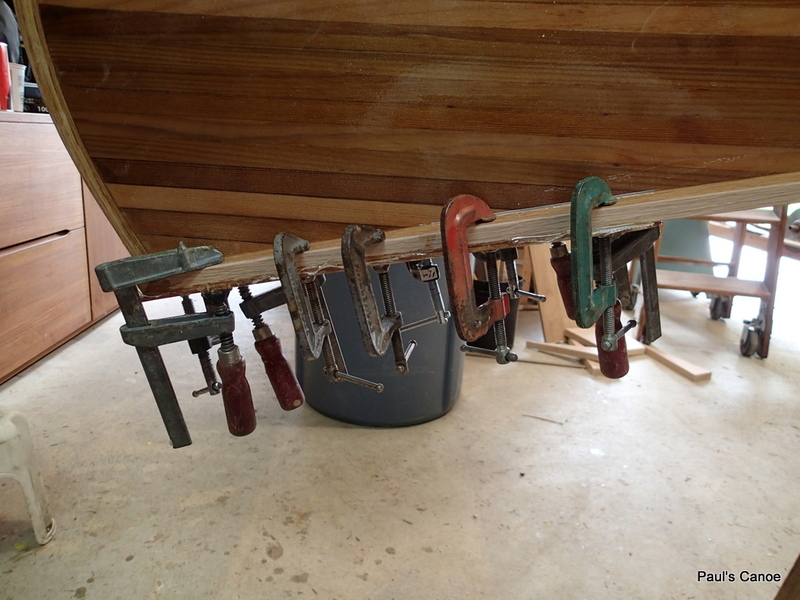 Decks clamped on side view. We leave the epoxy to cure overnight. The next day I decide to weigh the canoe. 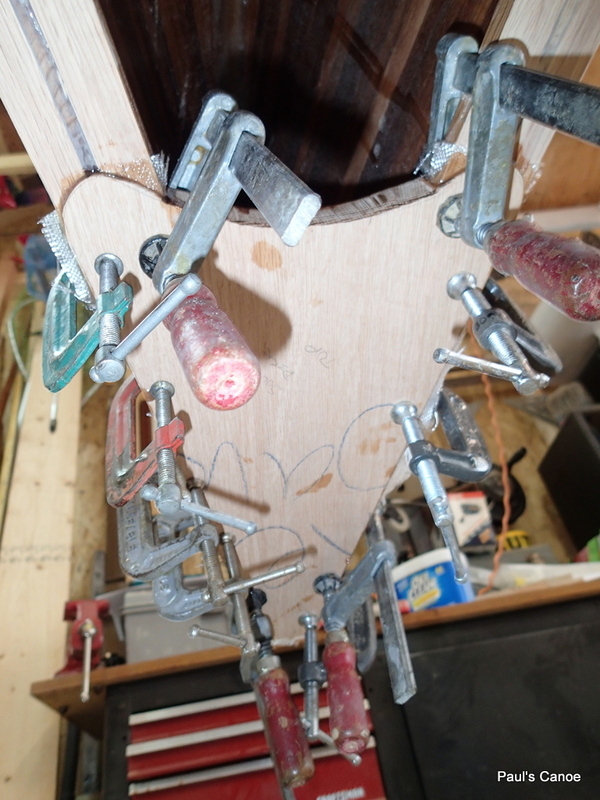 I take off all of the clamps and put in the seats and carrying yoke. Just under 50 lbs. 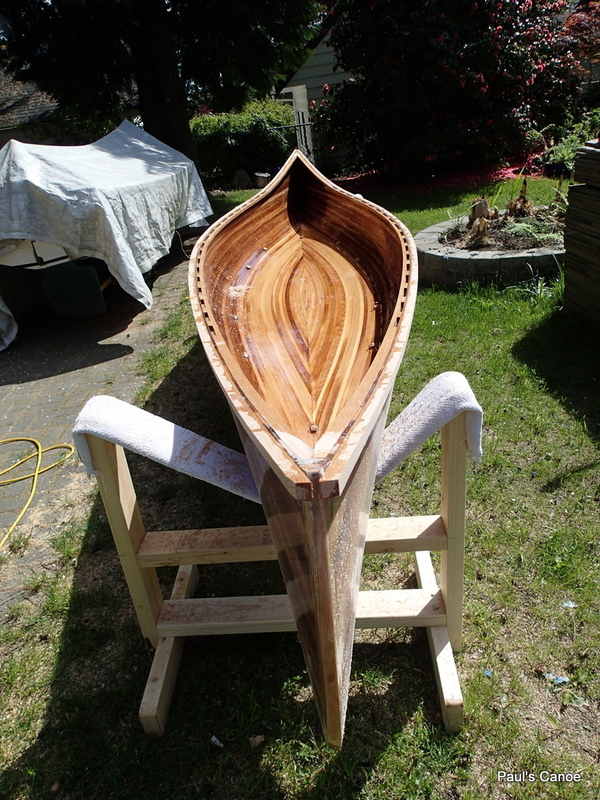 Canoe Craft design weight 48 to 50 lbs. right on track. 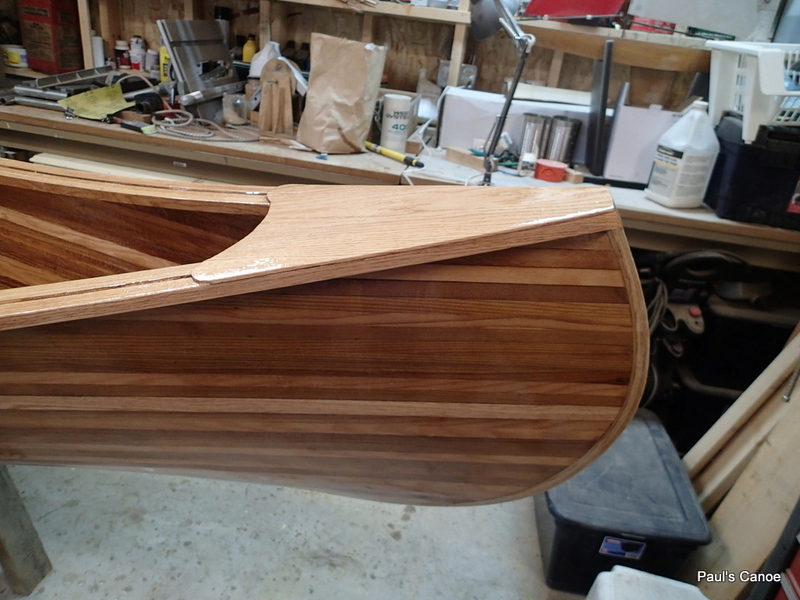 If Paul wants the canoe to be lighter, we will plane off more of the outside gunnels. Paul is happy for now. 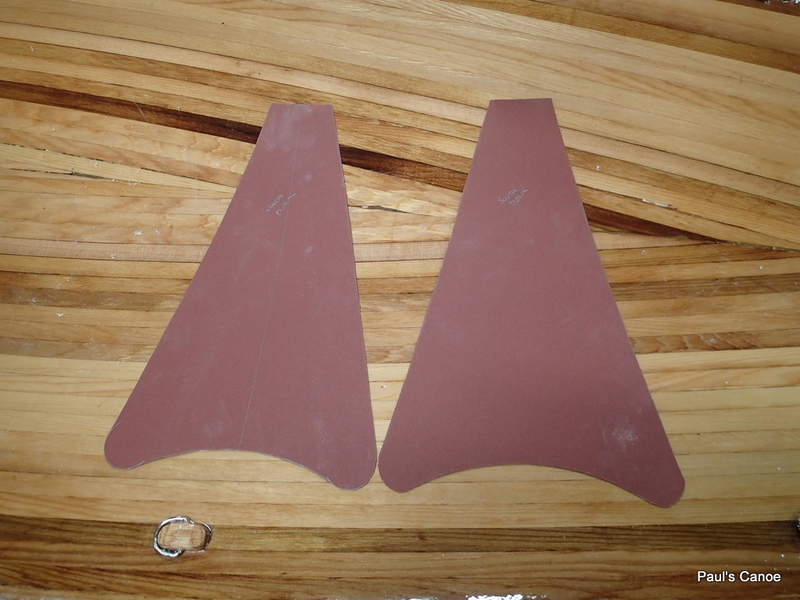 We feel that the deck is very substantial, as it is 1″ thick and epoxied to the gunnel tops and sides. Time to epoxy the decks and gunnels. Paul is at work so I roll on the epoxy coat. 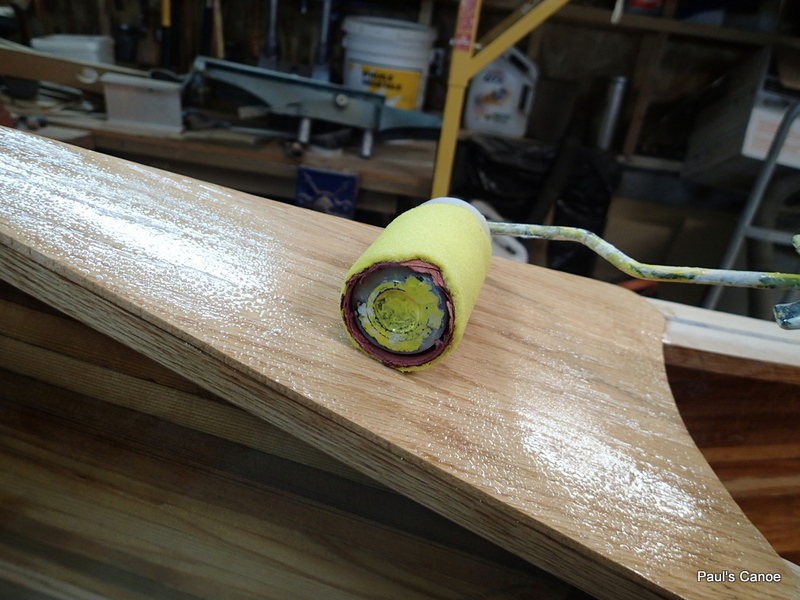 I roll on an epoxy coat onto the decks and gunnels. 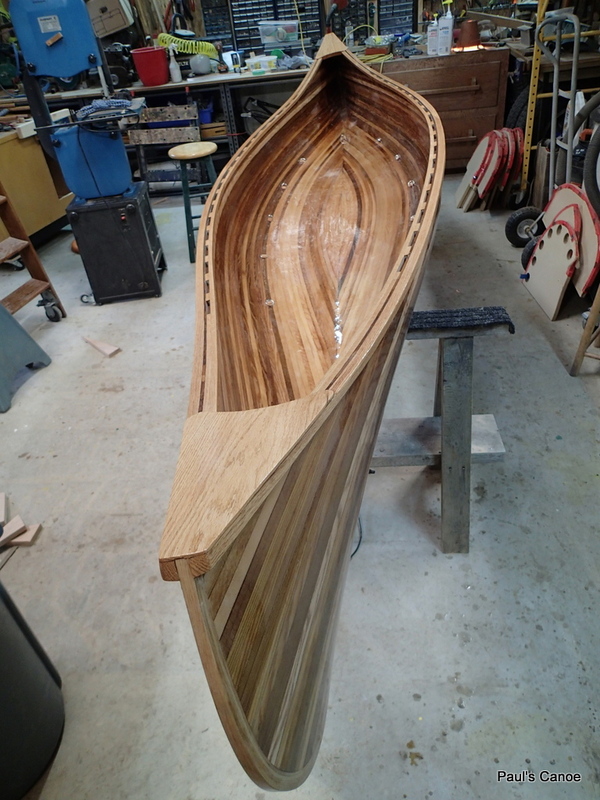 I now know what the canoe will look like when varnished. I roll out the epoxy for about ½ hour. I will come back in an hour or so and chase any new bubbles. 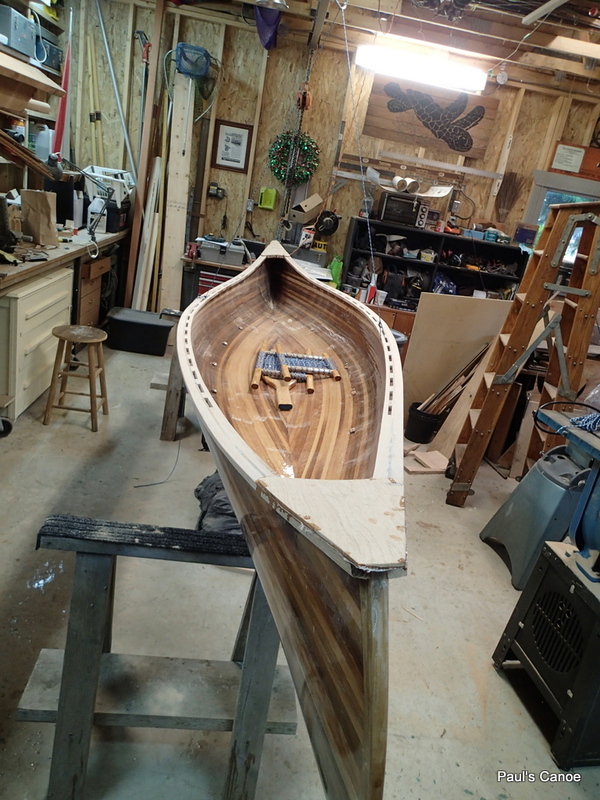 I will wait for the epoxy to cure and then put on another coat…Maybe tonight. Should be done with the ‘Poxy then.